The ever-growing online possibilities of sharing scientific knowledge have not led to researchers turning their backs on “traditional” physical scientific conferences. On the contrary, feedback from attendees of Elsevier conferences suggests that researchers would even attend more conferences than they already do if they had the option.As one respondent to Elsevier’s Researcher Insight Index Survey said, “A big component of conferences is the personal networking. You don't get that online.”[caption id="attachment_27090" align="alignright" width="153"] Nigel Clear[/caption]“I can vividly remember people predicting the end of the conferences business even 15 years ago,” said Nigel Clear, Commercial Director of STM Conferences at Elsevier. “Thanks to online solutions, a physical gathering of researchers to exchange knowledge would inevitably become redundant. Clear has been leading Elsevier’s Conferences department since 2006, when Elsevier organized 15 scientific conferences, attracting 4,000 delegates. In 2012, his team organized 50 conferences across all continents, attracting 16,000 delegates from a wide range of disciplines. “Of course I’d be the first person to claim that the high quality of our conferences is the secret to our success — and it is, to a certain extent,” Clear said. “What’s far more interesting, however, is the fact that even in this digital age, researchers still feel that physical conferences are essential.”He cited the Elsevier’s Researcher Insight Index Survey, a bi-annual anonymous survey that examines the drivers and influences on the communication of scholarly research. In a 2012 survey, researchers said they valued the networking opportunities along with unique, high-quality content. The survey also made clear that researchers value conferences as a key part of the scientific communication chain; 48 percent of respondents said they intended to release their research findings via a conference or poster session in the year ahead, making conferences the second most often used communication channel after subscription journals. “These interactions can be augmented, but not replaced, by online materials. The interface between online products and real-world events is becoming a key feature of the conference world, and the increasing ubiquity of smart phones and tablets has allowed conference organizers to provide an enhanced experience for delegates. The conference app is an example. Many conferences have mobile apps that enable delegates to view the conference program, discover speaker biographies, plan their day and even locate a specific exhibitor on the floor plan — all from the palm of their hand. At Elsevier’s recent Frontiers of Polymer Science conference, 561 out of 575 delegates downloaded and used the app, clearly demonstrating the appetite for innovative tools as a valuable addition to their conference experience. 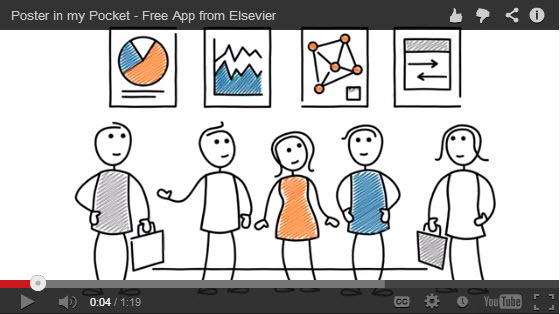 A recent example of technology adding value to live conferences is Elsevier's Poster in my Pocket app. It enables conference attendees to download scientific posters they find interesting directly on their mobile devices. Harald Boersma (@hboersma) is Director of Global Corporate Relations at Elsevier, based in Amsterdam.